Dunno why I had to make it this week, but something called out to me ... made <a href=“https://en.wikipedia.org/wiki/Mirepoix_(cuisine)“>mirepoix</a> and tomato sauce (heavy on the onions, cook it twice in a slow cooker, red wine and chicken stock second time, and use two cans fire roasted tomatoes and one large can plum tomatoes - make sure it’s all ground as fine as possible). That’s the finished dish at the top. Earlier stages appear below. 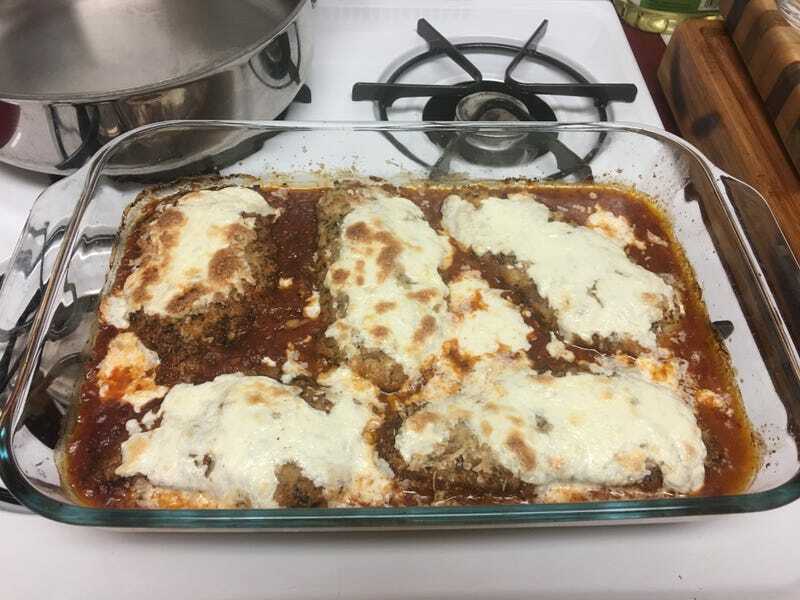 Instead of winging it, I used <a href=“http://www.geniuskitchen.com/recipe/authentic-chicken-parmesan-179233>this recipe</a>, but of course I couldn’t stick to it. Leave the parmesan out of the breading for the chicken and put it on top of the meat after breading. Grate it yourself. Under no circumstances pour tomato sauce on top of the chicken, as it takes away from the crunchy. You can serve over spaghetti/linguini/any pasta if you want. Reserve sauce and serve alongside as needed.